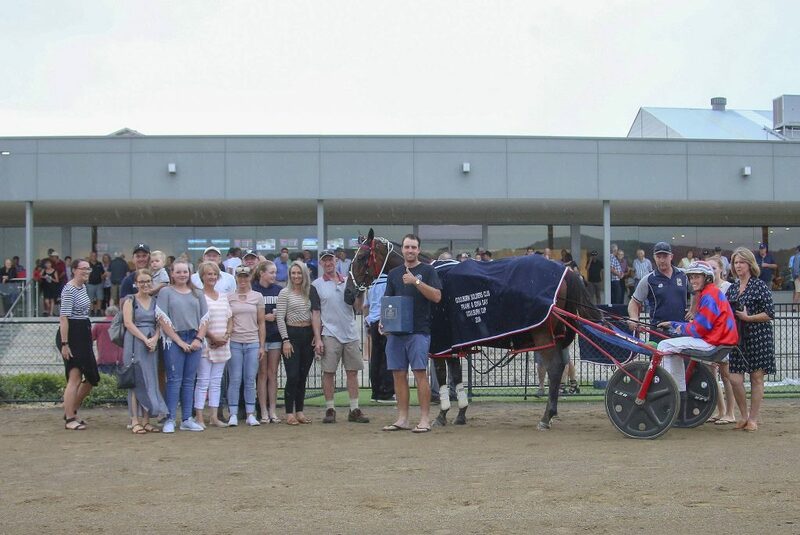 Having his first start in NSW following a successful trip to Victoria for the Inter Dominion series, Conviction and Amanda Turnbull left their rivals standing as the pair careered away with Monday’s Goulburn Soldiers Club Frank & Edna Day Goulburn Cup. The Group 3 $31,800 feature was the highlight of great afternoon of racing for the Goulburn Club’s annual Carnival of Cups race day. With a large crowd packing the long Grace Millsom Centre balcony, Rakarolla broke the line first charging across the field to take up the running from his outside barrier. Conviction, a 5 year old gelding by For A Reason who won the Goulburn Cup in 2014, started from gate 10. He was quickly away from his second row draw and as the field spread out with the fast early pace, Amanda found a spot three back in the running line. “They went out hard early; it worked out good as we got into a good spot” said Turnbull. With Rakarolla settling as the race leader, it was Left Tennant who found the spot outside the front and with the pair going head to head Conviction commenced a strong 3 wide move passing the 800 metre mark. In a fast 26.9 third quarter, Conviction worked up strongly to join the leaders three wide passing the 400 marker. Conviction found the front as the field straightened for the run to the winning post. Rakarolla and Left Tennant continued fighting out the minor place position as Conviction surged clear going on to win by 3.5 metres from Left Tennant. Spare Me Days for Goulburn trainer Brad Hewitt charged home strongly to take the third place position with Rakarolla holding on to fourth place. The winner recorded a good 1:56.3 mile rate and provided star stallion For A Reason with his first siring success in the race. Interestingly, the runner up Left Tennant is a full brother to For A Reason. Following the race members of the day family joined the presentation of the winners’ trophy and dress rug. 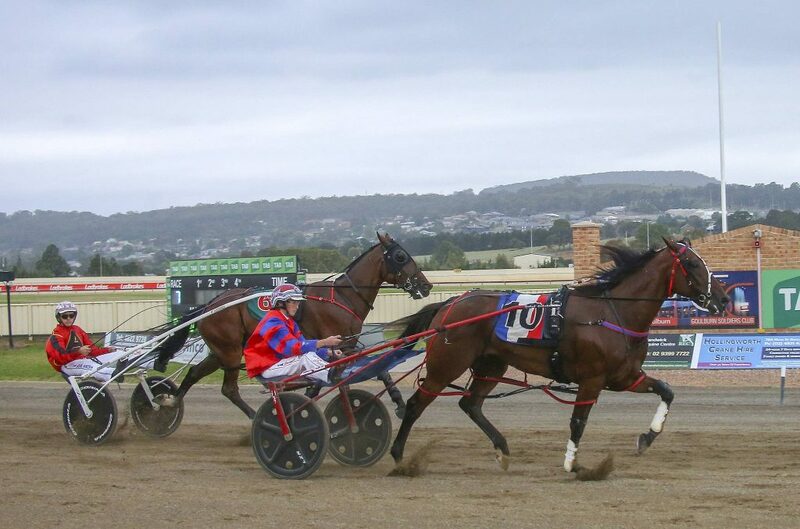 Conviction will now be aimed at the fast class races as part of the Menangle Club’s Miracle Mile Carnival. In the Hollingworth Crane Hire Service Goulburn Rose Menangle trainer KerryAnn Turner scored the first of a feature race double when Bronski Belle claimed the $19,080 race for C2/4 pacers. Making it 6 wins from her last 9 starts, the 4 year old Major Bronski mare was eased early before commencing a three wide move following Benalong Valley at the bell. Turner was then successful in the last of the day, the $10,600 Sun Solutions Goulburn Mulwaree Sprint with Aztec Bromac. In wet conditions Turner allowed the 7 year old American Ideal gelding to settle in the back half before unleashing a fast sprint over the last 300 metres. In a dominant effort, the pair scored by 3.1 metres over of Dream To Share and Izzy Watt, and recorded a 1:57.3 mile rate in the wet conditons. The afternoon of racing was another great success according to club secretary Mark Croatto. “It was great to see such a good crowd come out for what was really great racing and entertainment” stated Croatto. With the day also supporting the Convoy For Kids Goulburn charity, members of the charity were kept busy collecting the entry fee, organizing a vintage truck display and going around with a donation’s bucket. Goulburn’s next races on the 29th April when it holds the first of 5 race meetings primarily over the May/June period, with the club’s next feature race meeting being Goulburn Sapling Stakes day on the 13th May.